Over the next two weeks, we’ll be sharing with you our stories from Rwanda, but we’ve also partnered with the GPSmyCity app to giveaway 10 full access one-year subscriptions for FREE (valued at $18.99) to our readers! So exciting! Thanks to the full access one-year-subscription of the app, you’ll have unlimited access to GPSmyCity’s all inspiring travel articles about 1,000+ cities worldwide and all the self-guided walks and tours around the world! Each of the walks comes with a detailed map and information about the attractions. The app employs GPS navigation to guide you and you don’t need to have any data allowance or a local sim card - GPSmyCity works completely offline and turns your tablet or phone into a guide! GPSmyCity has plenty of walks in Africa too, that’s why we love it! It can take you around Addis Ababa, Nairobi or Mombasa, or around plenty of other Asian, American, Australian or European destinations. With our 3 week Europe trip starting in a couple of days, we are so excited to check it out in Poland, Germany, Austria, Hungary, Slovakia and Czech! Where are you heading next? All you have to do to win your FREE full access one-year subscription to the app, is leave a comment below (scroll to the end of the post, ofc reading it on the way :) and tell us where you want to travel or are travelling next! Ten lucky winners will be selected at random and notified by email, so please leave your email whilst commenting (the email field is going to be visible only for us). You can enter between 27th of May 2018 and 10th of June 2018. We arrived to Rwanda early in the morning when we crossed the Ugandan-Rwandan border in the small town of Katuna in the North of the country. We were extremely tired after taking the bus from Kenya, skipping across Uganda, so we were quite irritated waiting in the line to pass through customs. When we saw the Rwandan border control taking out people's loaves of bread from plastic bags and placing them into the paper ones, our irritation grew even more. But soon enough, we realised that we were actually irritated for no reason - after we spent some time in Rwanda, we started admiring how much this country cares about its cleanliness - making plastic bags illegal was just one of many steps taken in striving to keep the country clean. In this post we would like to introduce you to what it felt like to travel around Rwanda. In general we could say that travelling around Rwanda is quite easy - the transport links are good and the roads are all of very high quality. The country is small so it's not difficult to visit many different places during your stay. Booking activities may seem tricky but it's actually easier than you think. But more of all these aspects below. WHAT ARE RWANDA'S ACCOMMODATION PRICES LIKE? 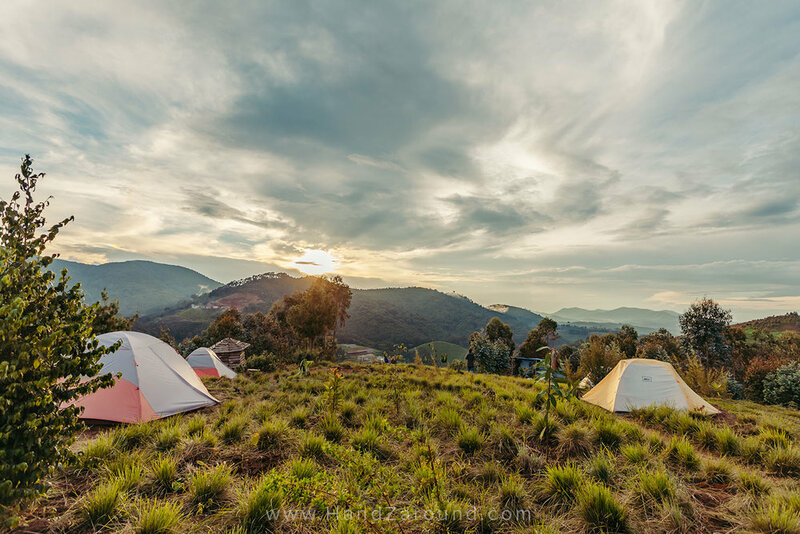 In Rwanda we were hosted by places which were varying from 15 USD to 1000 USD a night - camping, glamping, safari tents or high end lodges. For more details on where we stayed, visit our other pots. Accommodation is a tricky one in Rwanda. It can be very expensive but there are ways to work around it. If you're looking into staying at a standard modest hotel, you should be ready to pay approx. 80-100 USD per night for two people. High-end, boutique, luxury or unique places will cost you approx. 400-1000 USD per night for two people. The budget options are campings, AirBnBs or tiny guesthouses that you will only find by word of mouth as they don't exist on a map, approx. 10-40 USD per night for two people. Prices in Rwandan hotels are usually per night, per person, so always check. The high end places will most likely offer a full board, included in the price. Keep in mind that even if you pay 1000 USD a night, and you think everything's going to be perfect... it might not be. For example, the furniture may still be chipped in some places and the doors may not close unless you give them an extra hard push. The high quality finish is not a strong point of Rwandan's top end accommodation. Obviously we haven't slept in every single place in Rwanda, but we were lucky to spend nights in a few of Rwanda's famous luxury spots and this is what we experienced. 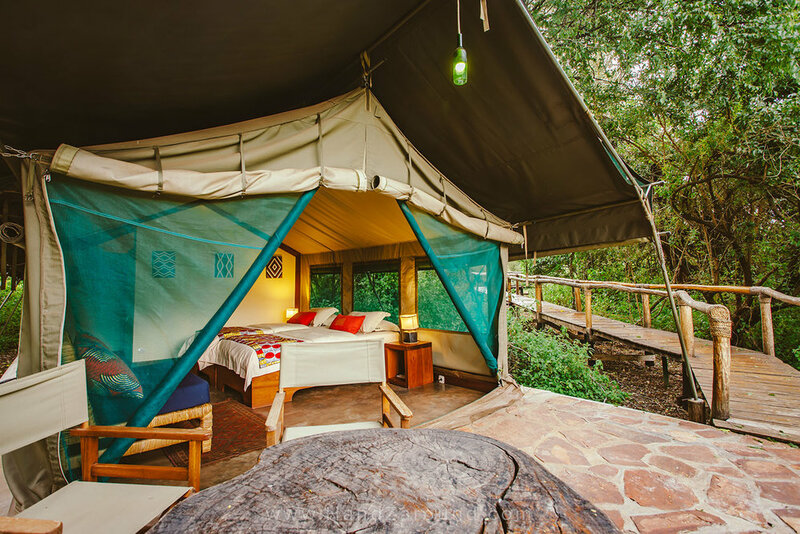 On the contrary, the camping or 'glamping' spots, such as Inzu Lodge or Kitabi Eco Center, are quite a good value for money and a pleasure to stay in - it's a basic setup but great accommodation. Although at times, when you travel or backpack around Rwanda, people may seem to be staring at you and the atmosphere may seem tense, it's just a first impression. When you actually get to know a Rwandese person, you'll see how friendly and helpful they are. When looking for advice on how to travel around Rwanda, you will undoubtedly come across the RDB (Rwandan Development Board) Website. In our humble opinion, the website looks great and describes the type of activities that you can do throughout the country well, but it is seriously lacking any practical information on how to actually book something, where you need to be, duration of trips and ultimately the prices. All links on the website eventually lead you to emailing RDB for any booking requests. We tried to get in contact with them on numerous occasions but simply never heard back from them! The best experiences we had was booking trips and tours with the hotels/lodges that we were staying with. They always had some sort of local tours available that you could book directly with them and the money that we were paying was more likely to go through less 'hands' and end up with the people who actually earned it. Many of these places will offer completely unique experiences that you will not be able to find and book online. Tour companies throughout Rwanda often do not have set prices on display. For us, this is where our interest in them stops. We found that they like to 'size you up' first and then quote you a price on what they think you will be willing to pay. We hated the back and forth process of negotiating a price and wish that the price was just listed. Travelling around Rwanda independently is more than possible and we have put together some tips and some info about the things we learnt whilst visiting in our post 'Rwanda - Low Budget, Independent Travel & Local Tours'. What is Rwanda's Transport like? In Rwanda, nothing really is too remote. Because the country is relatively small (26,338 km2, or, about 10 times smaller than the UK) with a population of approx. 11.5 million people, when you drive somewhere, there will always be people walking by the side of the road and you can't really get lost. Even if you need to drive from one town to another for hours, whether it's through the beautiful asphalt road or a very-well kept dirt road, there will always be small villages on the way, so you'll always get a chance to ask about directions (Google Maps may be a bit off). The only place that seems to be remote and wild is Akagera National Park in the East of the country. You can drive for hours there and not see a human (lots of animals though!). The roads are of great quality - most of them are asphalt, some are unpaved but they're still in great shape, without bumps, potholes or obstacles. Car hire is reasonably priced in comparison to other countries in East Africa. We rented a Toyota RAV4 in a great condition for 30 USD a day (in Kenya we paid 35 USD a day for an old Toyota Axio in a poor condition). Motorbike taxis are everywhere - the driver will always have a helmet for you as it's compulsory in Rwanda for the driver as well as the passenger to wear helmets. There are plenty of coaster buses between the cities and smaller minibuses on shorter distances. If you're leaving from Kigali, head to Nyabugogo Bus Station - you will find buses leaving in all directions, including international destinations such as Uganda, Kenya and Tanzania. If you're heading to Burundi, you'll have to change the bus on the border. Taxis are not very popular but they exist. You'll find them in Kigali but hailing one may be difficult if you're not in the centre. Best is to save a local taxi's number when you find one for later, in case you need it on your way to the airport or bus station. The moto may not have enough space to fit you and your big backpack/suitcase. what is life like in rwanda today, after the genocide? In case you're not aware - in 1994 the country went through a horrible time of Rwandan genocide. We learnt a lot about it visiting Kigali's Genocide Memorial & Museum and you can read about it here. Life in Rwanda today, after the genocide, is actually thriving. At least to our eyes - we can't speak for the Rwandese. The young Rwandese population (who we spoke with) love their country and the pace at which it is developing. You need to see it to understand it - it's simply incredible how well Rwanda has developed. Its economic and social ideas for development are in our opinion great (we're talking e.g. about Umuganda or Gacaca). The country is ridiculously clean. Although there are some sectors that need improvement, it's just a pleasure to see that a country can lift up from a difficult past to such a bright future. We're sure that like every country, Rwandese society too has its complications, but the unity of the whole nation and the will to overcome its past problems is simply astonishing to us. What is food in Rwanda like? Rwandan ugali (the pinched ball in the photo) is delish! Food in Rwanda is an interesting subject for us. Rwanda is the first country we visited in Africa that didn't have street food (which we love so much, and usually live off!). To be honest, we actually struggled with organising our food in Rwanda - usually when we get hungry we just go out and grab something to eat. We rarely plan where to eat when we travel and we like discovering food places as we go. In Rwanda, this was a bit tricky because the waiting time in cafes or restaurants was usually quite long. We waited approx. 30 minutes to get a bowl of chicken soup, and about 1.5 hours to get a meat meal. If you do go to a restaurant you can call earlier and order - this may or may not get you your food quicker...no promises, but it's worth a try! Rwanda has a variety of local foods on offer, like ugali (a maize meal), meat, fish or veggie stews, sweet potatoes, cassava leaves (a bit like spinach), beans, cooked bananas (not sweet! ), sambaza (found in Lake Kivu area - a tomato and small sardines stew), and western dishes like pastas, pizzas, fried chicken, sandwiches etc. Obviously, the western dishes are usually double or triple the price of local food - there is good selection of western influenced establishments in Kigali so you will find them there. The presence of police around the country carrying semi-automatic weapons may seem intimidating, but in reality it's nothing you should be worried about. Rwanda is the safest country we've visited during our time in East Africa. The officers patrolling towns and roads may not be super friendly looking but they surely keep everyone safe and everything in order. Rwanda is the first country we visited in Africa where nobody really hassled us on the streets. We walked around Rwanda's capital, Kigali, after dark with no worries. Of course, we stayed sensible when carrying our valuables on the street because thieves exist everywhere in the world, but we didn't have any problems. We did hear a story of a phone being grabbed from a friend's hand by a moto driver whilst she was walking in Kigali's centre, however if you're careful and aware of what's around you, there should be no problems. When checking the government websites for Rwanda's travel safety (especially the Australian gov advice), you may hear about the unrests in refugee camps or conflict near the Rwanda-Congo or Rwanda-Burundi borders, however we never experienced anything negative - even though we almost drove to Congo by accident when visiting Gisenyi & Lake Kivu. As always, any protests or unrests are very localised and most often not aimed at tourists, so there shouldn't be anything you need to be worried about whilst visiting Rwanda. When is it best to visit Rwanda? The weather in Rwanda may be unpredictable at times! Here, Zach is getting covered with a fog cloud in Nyungwe Forest. We spent the whole March in Rwanda and during that month we experienced some pretty severe rain but still had sunshine on most days for at least some parts. As the rainy season progresses into April and May, it keeps raining more and more. As the name suggests, it's fairly dry during these months and usually a light cloud cover keeps the temperature down. It still does rain occasionally. It's the high tourist season in Rwanda. Expect rain and a bit of sun during the day. Umuganda basically translate to 'coming together to achieve a common goal' and is a community work day once a month in Rwanda. On the final Saturday morning of each month, communities come together to work on projects such as: fixing roads, building bridges, painting schools, cleaning up and doing other infrastructure works. Umuganda is usually completed by 12pm and people return to their daily work. It doesn't really affect the tourists but it's good to know it exists and be respectful of it. April is the month of mourning for the 1994 Genocide. From April 7th through to the 13th many shops and businesses are closed as the citizens pay their respects. It is also the height of the rainy season where you can expect it to rainy quite heavily almost very day. Most of the expats and tourists leave Rwanda for that period of time. Is visiting rwanda on a budget Possible? View from Kitabi Eco Center - an affordable spot where you can camp, glamp and go on eco tours. You may want to check our ideas for affordable local tours and see what we did and where we stayed in Lake Kivu, Akagera National Park (aka the most affordable safari in East Africa!) 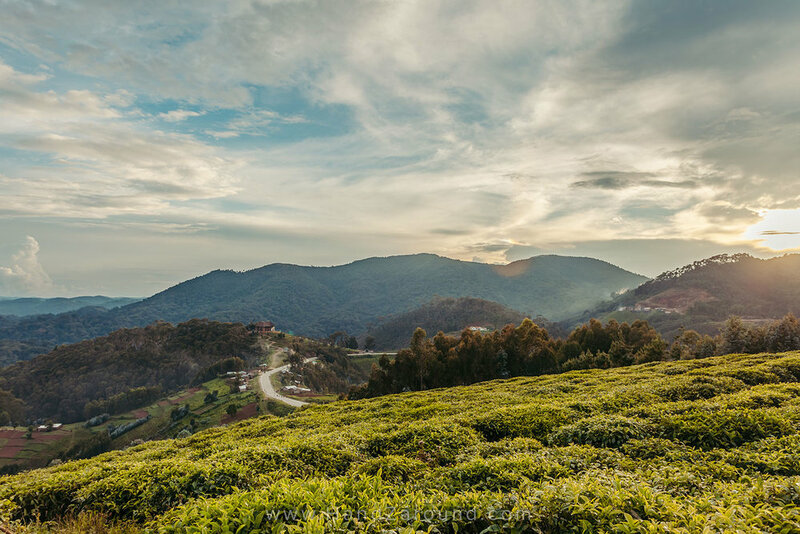 and Nyungwe Forest. Whilst visiting these places, we tried to collect information on how to visit them cheaply and genuinely learn about Rwandese culture and what it's like to live in Rwanda. Accommodation and tours may seem to be expensive but once you find local tours lead by communities and not tour operators, and camping sites or AirBnBs instead of posh lodges, you will be fine with your small budget. what is rwanda known for? Some people may not know that you can have the most incredible safaris in the East of Rwanda, in Akagera Park. If you're lucky, you may even spot the whole 'Big 5'! Gorilla trekking and the 1994 genocide are usually the first (and unfortunately often only) things people say when you ask them what they know about Rwanda. We think it is sad and we really want people to know more about Rwanda. There is so much more to this beautiful country that deserves a visit from more tourists. Not only gorillas, but also golden monkeys, beautiful hikes, walks and nature. Chimp trekking, enchanted forest hikes, canopy walk, camping, stunning nature. The most affordable and unique safari which we absolutely loved! Quaint, peaceful stay where you can see amazing Rwandese fishing culture. Total gems of the country - views like that are very hard to find! It's a wonderful city that has so many fun and interesting things to discover. Rwanda is a heaven for anyone that loves high quality hand-made produce. And of course we couldn't forget about showing you Rwanda's amazing roads - it's just a pleasure to drive through the country on its psotless asphalt roads with beuatiful views! We were hosted by some of the places or accommodations mentioned in this article, however all opinions are, as always, ours.